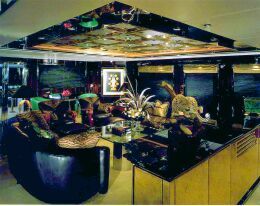 The interior design of a yacht is definitely one of the most exciting moments of the project, the phase when you decide how to divide up the space available and how it is to be used for the various necessities on board: areas destined to be used by the guests, the crew, propulsion etc. This phase sees the involvement of the two figures in the project: the naval architect and the architect; the naval architect, which is an English term that in Italian is similar to a naval engineer, must make as much space available as possible inside the yacht for the living quarters, compatible with the technical and functional needs of the naval platform and international regulations that, as recently with the notorious MCA, "steal" many resources; on the other hand, the architect has to distribute and furnish the areas according to the desires of the owner, coming up with internal styling that satisfies him. It is impossible to define all the different styles because interiors have been designed in so many different ways, in fact while for exteriors the designer may oppose the at times extravagant wishes of the client by presenting solid, serious and impregnable technical reasons, to which the latter must surrender either due to doubt or fear, as far as interior style is concerned, owners get their revenge by asking for things that at times go beyond the most fervid imagination; the results being some of the yachts, mainly American, from the eighties and nineties (Photo 1). Generalising to some extent, it is possible to identify some tendencies, even if they are not really styles in the true sense of the word, which are interesting for their interior design; one is without doubt the minimalist/functional trend (Photo 2), in which empty space is given the upper hand over furnishings, luxury and the sensation of peace are provided by the use of natural materials such as rush mats, exotic wood which however is not varnished to a shine and objects with modern design; this is the style that I prefer and that I try to suggest above all for a Mediterranean or Caribbean use of boats. It's a shame that it is only really effective when there is a lot of space available; it is therefore difficult to plan for boats under 45-50 metres, as well as it losing its simple aspect it is also very expensive to realise. Another tendency is that of the so-called "modern contemporary", the timid request mainly made by boat builders who are not very convinced in their search for something new but not exaggeratedly so, for fear of frightening off the clientele. (Photo 3) This results in a style that is without doubt opulent, with an abundant use of marble, deep carpets, expensive leathers and above all of the ever present shiny cherry wood - they have even started to make car interiors with it; a pleasant, "low risk" style, but that I frankly do not find relaxing; you don't feel you are on a boat and even less that you are on holiday as it offers a hotel-like richness. It was very popular throughout the nineties and is rapidly becoming old hat. 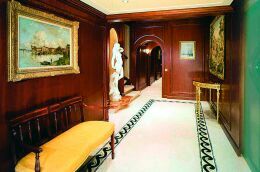 A very personal style that has deep roots in the history of yachting is definitely the one that I would define as "classic contemporary", a sort of neoclassic if you like; it certainly goes back to the sailing boats of the past, with generous use of wood (Photo 4), columns and solid wood blocks recalling details linked to an anti-rolling function. This is a style that can also be interpreted in a modern key in a stupendous, elegant way (Photo 5) or can slide into opulence for the sake of it but still with personality (Photo 6). The materials used the most are without doubt mahogany, wide fabric panelling, sofas and seating in comfortable, classic shapes. 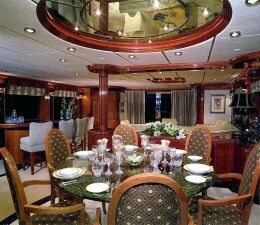 It is certainly no courageous leap into the future but maybe due to this link with the past, with the tradition of classic yachting and with the desire of any of those who set sail to shelter in a comfortable, welcoming interior. 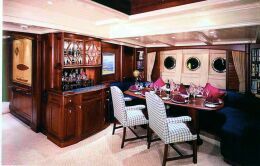 It is one of the most widespread approaches in interior design and also very popular in Anglo Saxon yachting, which represents most of the big boat owners. 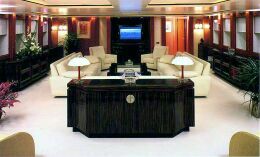 It is definitely possible to design any kind of interior for a boat but I am convinced that there is a deep rooted link between the external character of a boat and its interiors, a link that if highlighted in the right way cannot but increase the value of the yacht, its success and the satisfaction of those who use it.